From DQ Fitness Advisor Doug Walsh, who is bicycling around the world or something. Maybe more than once. I arrive in Eureka, Montana with six days of stubble and the knowledge that the loudest geese are those flying only as a pair; that freight trains have 114 cars whenever counted; and that hearing wolves howl in the middle of the night is a sound that takes some getting used to. Especially when in a tent. We've now pedaled 700 miles since leaving Seattle. My wife and I have averaged over 55 miles per day in the saddle, and we've arrived early. Two months too early to be exact. Everywhere we go, from towns of just 79 residents to those much larger (e.g. 507 people), someone has been quick to tell us we're crazy for being out this early. "The bikers don't usually start coming this way until May or June," they say. Some call us premature, others call us nuts. And one, a bearded Montanan in dirty jeans and a fishing hat, told Kristin that she's far more adventurous than himself. That was my favorite. 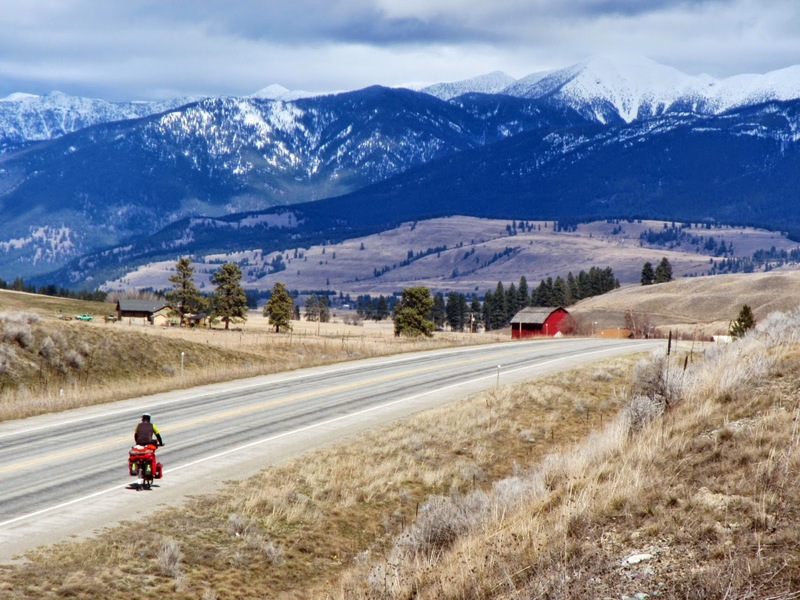 Pedaling east along the 49th parallel this time of year hasn't been all that bad, though. Sure, we have to spend a few extra minutes in camp each morning brushing the frost off the tent, and we each go to bed with two pairs of heavy wool socks on to ward off minor frostbite (not to mention fleece hat and gloves, and down sweaters), but the days have been bright and sunny, and we've enjoyed some wonderful campsites along the Pend Oreille, Bull, and Kootenai rivers this past week. Of course, when people warn against an early spring crossing of the Pacific Northwest, they're thinking of the mountain passes. And for good reason. Though we've already tackled three of the four major mountain passes that stand between Puget Sound and the Great Plains -- Stevens, Wauconda, and Sherman (all in Washington) -- the descents weren't the freewheeling euphoria they are in the summer. 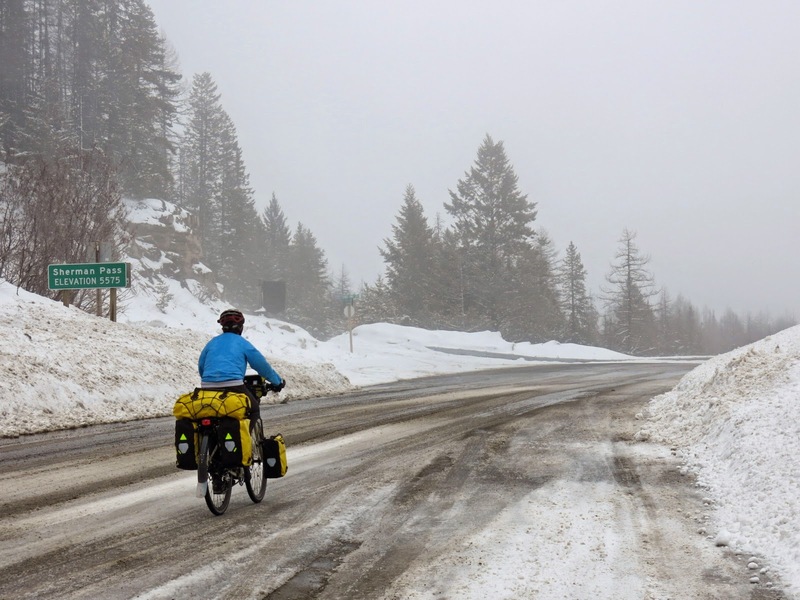 Each of the descents took place in full winter conditions: freezing temperatures, sleet ripping at our faces, and slush and occasional ice on the roadway. Still, these are small prices to pay for endless views of white-ringed peaks, solitary camping, and vacant rural highways that, I suspect, teem with traffic in the summer months. We'll clear the Continental Divide early next week and then begin the long, slow, descent across the Great Plains to Fargo. But first we're going to rest our legs (and our saddle sores) in this little town just seven miles south of the Canadian border. You can follow Doug's trip in far more frequent detail at Two Far Gone.